Sometimes we think of Etsy as this international macrocosm, but in reality, it's also in our local backyard! So this roundup of local Etsy shops is showcasing the amazingness that is wedding details right here in the 757. Lots of thanks goes to local Etsy owner Dana of CereusArt for helping me compile a lot of these together! From monkey knots to vintage suitcases, there are tons of details for all types of weddings. Your wedding shouldn't be a Pinterest explosion, but sometimes you need that perfect tea kettle to finish off your garden wedding centerpiece or rustic fishing nets to reserve the front two rows at the ceremony. Wanting a nautically good time on the big day? The Perch Shop's monkey knots will complement any centerpiece! Table numbers, food signs, or anything else you want to label for a vintage-inspired wedding-- these cute mini-chalkboards are perfect from Pancakes and Glue Guns! From suitcases to vases, Meghan Blair Vintage (whose owner is actually part of the Emily Weddings team!) has great vintage finds for centerpieces or general decor. Looking to tie in a little military love at your engagement party or wedding day? 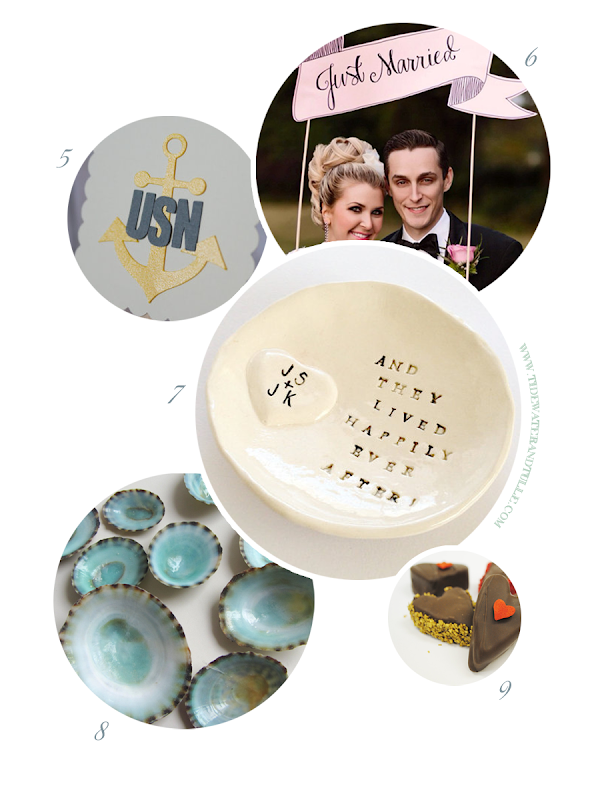 A Navy Heart has some shabby chic military-inspired cupcake toppers that could even double as drink stirrers. Malaine of Coastal Calligraphy offers a great visual to the range of calligraphy goods in her Etsy shop. We all love wedding day mementos that can carry over into post-wedding days! These ceramic ring dishes and ceramic cake toppers from Magic Markings Art can serve double duty for detail photos and jewelry holders for later. 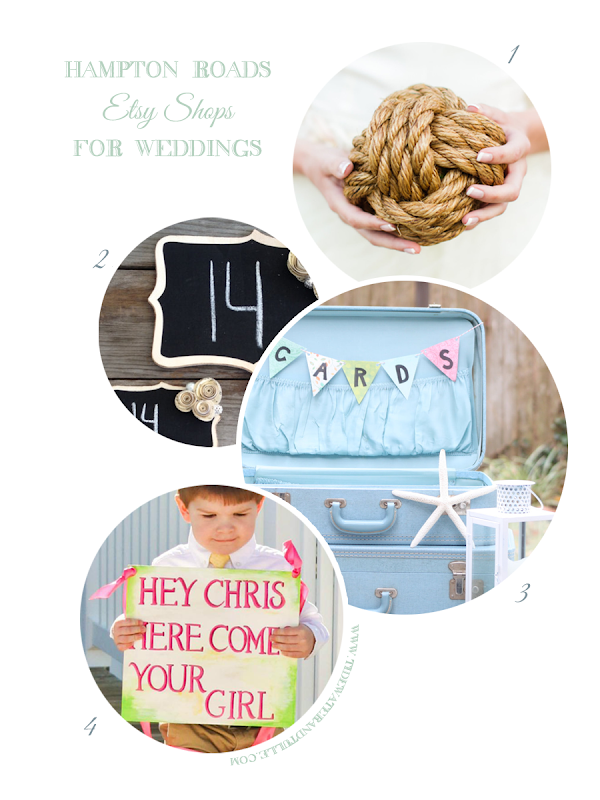 If you're a DIYer and are having a beach or nautical-inspired wedding, CereusArt offers great craft stock for you to create. From starfish to shells to driftwood, possibilities are endless. Who doesn't love chocolate? The Blustering Baker specializes in a variety of different sweets for every palette. Chocolate truffles will always go over well for a wedding favor. Editor's Note: I have no personal experience as a buyer from these shops, but each shop's Etsy reviews show great customer service, so I'm showing some love! :) For photography credits, please visit each shop's descriptions.